Our office utilizes computerized Spirometry testing to diagnosis and evaluate the treatment of lung disease. Once lung function is evaluated, there are numerous treatments our office may utilize to improve the condition. Who Needs a Spirometry Exam? The lungs allow oxygen from the air to pass into the bloodstream and carbon dioxide to move out. The cells of our bodies need oxygen in order to work and grow. Our cells also need to get rid of carbon dioxide. Research supports that as lung capacity diminishes, there is a direct correlation with diminished longevity. Spirometry is completely non-invasive and the most accepted diagnostic tool to evaluate early lung disease. Current opinion in Pulmonary Medicine. 11(2):115-120, March 2005. 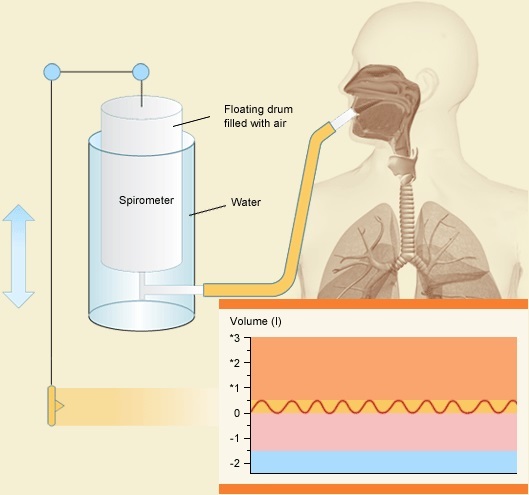 Purpose of review: To review the basis for Spirometry, its benefits in diagnosing and managing both acute and chronic pulmonary disorders with emphasis on chronic obstructive pulmonary disease, and to critically examine the barriers to its widespread use. Recent findings: A number of recent articles have established the scientific basis for Spirometry in the early identification of chronic obstructive pulmonary disease and in improving smoking cessation in patients with chronic obstructive pulmonary disease. Economic and other considerations are reported. Summary: Spirometry is an important office diagnostic device that should be used by all primary care and most specialist physicians. Spirometry is to dyspnea as the electrocardiogram is to chest pain. Curvature of the spine has been proven to compromise the ability of the lungs to expand, thus preventing normal function. Abnormal curvature can also weaken the diaphragm and compromise lung function by irritating nerve function to these tissues. Our office has complete care programs dedicated to improving spinal imbalance. Our physical therapy department utilizes specialized diaphragm-strengthening exercises as a part of care. There are many factors that can affect lung function such as metal toxicity, systemic yeast, neurotransmitter imbalance, hormonal imbalance, and nutritional imbalances. Our office has a full spectrum of tests to evaluate these concerns. Once a problem is identified, natural therapies are utilized to correct the condition. Our office utilizes advanced food allergy testing to modify dietary problems that may be contributing to lung dysfunction. Homeopathic desensitization techniques are also available to neutralize seasonal allergy complications.